I heard this phrase this week and I just love it. As business owners we often have a skeleton in our closet. Something we really hope people won’t notice about our product, service or ourselves. Something that could be seen as a failing….or reason for people not to buy. 2. Make the skeleton dance! You see, this week I’ve launched my free Video Marketing Kickstart course. As you can imagine, producing a series of videos about….wait for it….producing a series of videos…..you can imagine there is a huge sense of “I have to make these so amazing they will blow people’s minds”. After all, most multi-million dollar launches in the last year have continually raised the bar on video production until they are nearly Hollywood standard. That’s a lot of expectation. But then, I know if I’m feeling the need to compete with Hollywood, then entrepreneurs who have very little experience and confidence with video must be so intimidated, it stops them using video to market their business at all! I’m passionate about helping business owners get their brands known world-wide, attract profitable clients and build trust, credibility and profits. My approach is simple. I know business owners want to get the best results, for the least effort and the lowest price. When it comes to video, I know it is your content, message to market match and visibility strategies that will get you the results…not expensive production. How did I make the skeleton dance? In the Kickstart series, every single video has been filmed using my phone, no fancy lights, no tele-prompters and no studio. In fact they have been filmed on the beach with a teenager holding the camera still. And if you’re wondering how people respond? Well here’s a few comments. As you can see, none of them say “these videos are not professional”. It is comments like this, that I wish for you to receive on the wonderful videos you will create. So come over and grab the KickStart training now. It will only be available for one more week, then it goes into the online training area for my Video Marketing Academy members. P.S. 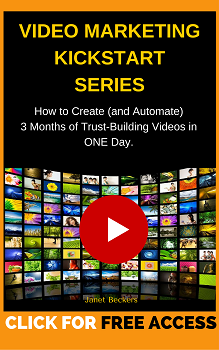 As well as training videos, you’ll also get a PDF with each video with Marketing Plan Templates, 7 Step Video Scripts and a comprehensive, step-by-step Blueprint. All for free, and only for one more week. Love the dancing skeletons! Will remember this blog post forever because of it.